Erlangen – May 17, 2016 – To expand its GNSS support, IZT GmbH announced the cooperation with TeleOrbit, the marketing & sales unit of TeleConsult Austria. As a result of this agreement the generation of GNSS signals provided by the GIPSIE® software from TeleOrbit will be integrated into the feature set of the IZT S1000 signal generator. The S1000 signal generator with its broad frequency range and the Virtual Signal Generator (VSG) channels enables the similar generation of various GNSS standards in one device which can be combined with interferers or broadcast signals. In addition, it supports the combination with recorded signals. 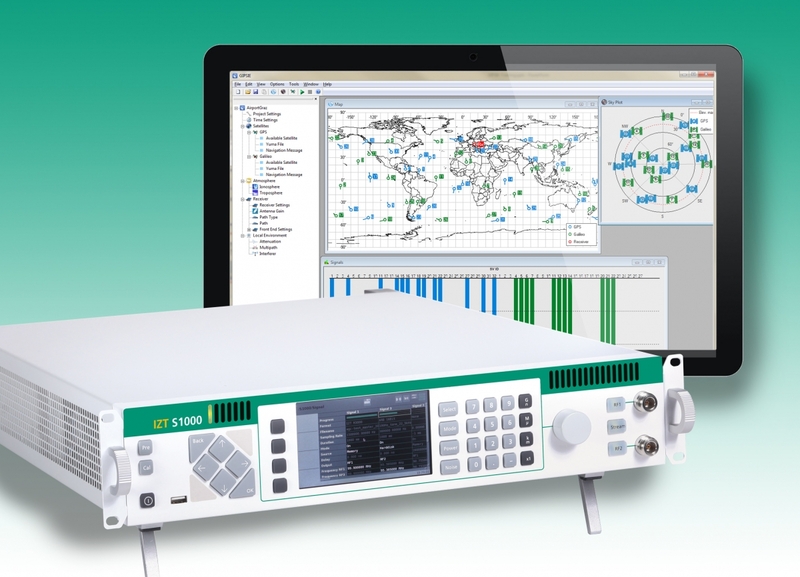 The software-based GNSS multi-system performance simulation environment GIPSIE® from TeleOrbit consists of two modules, the satellite constellation simulator (SCS) and the intermediate frequency simulator (IFS). While the SCS simulates the satellite orbits, the IFS generates complex baseband signals for the virtual signal generators of the IZT S1000.The signal generator currently supports multi-system, multi-frequency scenarios of GPS L1/L2/L5 and Galileo E1/E5/E6. The integration with the GIPSIE software enables the IZT S1000 signal generator to generate ideal GNSS signals for different standards. Based on the new software option the S1000 simulates the signal propagation from the satellite to the receiver. Furthermore interferers can be added using the VSGs of the S1000 to examine their influence on the signal propagation. At the end the related analogue signal will be released to the DUT (device under test) of the client. The combination of the IZT S1000 signal generator and the sophisticated GNSS software enables significant cost savings during receiver development, verification, qualification and certification, while time consuming test runs and validations are unnecessary. The broad spectrum of applications ranges from end-of-line testing in production to the development; optimizing, test and verification of acquisition, tracking and positioning algorithms; the generation of multipath strategies and algorithms to minimize interference susceptibility; the evaluation of baseband receiver hardware or positioning algorithms and the identification of ideal settings/adjustments to improve the capability of GNSS receivers, etc. The IZT S1000 offers a compact multi-channel high-performance platform for complex and versatile simulation and testing in one device. With its broad frequency range and up to 31 virtual signal generator channels the S1000 enables the similar generation of various signals (like different GNSS standards) in one device. This unique approach makes it possible to simultaneously simulate a test environment with multiple sources and to replace extensive setups while reducing time and cost. Due to IZT’s patented approach for signal synthesis, the IZT S1000 is capable of processing and combining a high number of signals in a very efficient manner. The cumulative bandwidth of these signals can go up to 320 MSamples/s. The S1000 generates a 120 MHz wide composite output signal from up to 31 individual signal carriers. Each signal can be set in two independent 120 MHz blocks within the frequency range up to 3 GHz. The Innovationszentrum für Telekommunikationstechnik GmbH IZT is a spin-off of the Fraunhofer-Gesellschaft, Germany’s leading institution for applied research. Founded in 1997 in Erlangen, the company emanated from the Fraunhofer Institute for Integrated Circuits (IIS). The Innovationszentrum für Telekommunikationstechnik GmbH IZT speciales in the most advanced digital signal processing and field programmable gate array (FPGA) designs in combination with high frequency and microwave technology. The product portfolio includes equipment for signal generation, receivers for signal monitoring and recording, transmitters for digital broadcast, digital radio systems, and channel simulators. IZT offers powerful platforms and customized solutions for high signal bandwidth and real-time signal processing applications. The product and project business is managed from the principal office located in Erlangen/Germany. IZT distributes its products worldwide together with its international strategic partners. The IZT quality management system is ISO 9001:2008 certified and conform to the requirements of ISO 14001:2004. An experienced Locatineering© enterprise, TeleOrbit GmbH operates as a manufacturing and sales company for GNSS and mobile positioning technologies as a core business. A highly qualified staff and the co-operation with well-known companies as e.g. Fraunhofer IIS and TeleConsult Austria GmbH guarantee professional and efficient solutions for SATNAV-technologies and SATNAV-based services. TeleOrbit elaborates customized solutions in the field of mobile locating technologies. The competences range from distress call, search & rescue and assistance services for private mobility, tourism, safety at work and security to surveillance of goods transport. This news release is available for download at http://presseagentur.com/izt.